Homebrewers love quick disconnects! Perfect for the busy homebrewer with a lot to do on brew day. 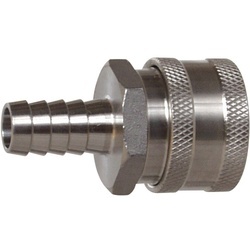 The MPT Stainless Steel Male Quick Disconnect is used with the female version of these QDs to give you a great seal in either flow direction. 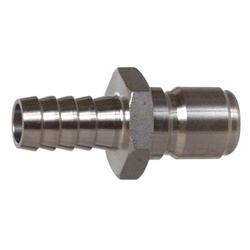 They are easy to connect and disconnect, and are made from high-quality 304 Stainless Steel for long life and durability. This QD will work with any of our H503 and H507 series of quick disconnects. 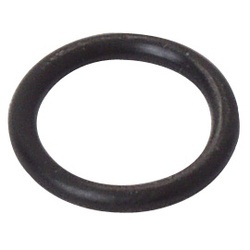 However, it does not work with any of our plastic or brass quick disconnects. 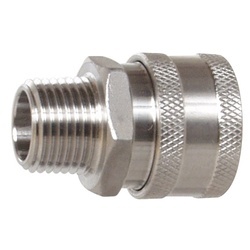 These feature a 1/2" Male National Pipe Thread on the outer ends for easy connectivity to almost anything. 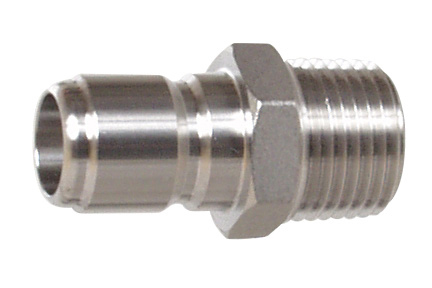 The quick disconnect will hold pressure for typical brewing applications when moving liquids at 60psi or less. 1/2" ID. Open port, does not have shut-off. Please Note: This product will NOT work with our Brass or Plastic Quick Disconnects.